I was surprised the other day when my husband said this to me while we were looking at our toddler with the utmost affection and love as he was slipping into his dream world – “I now feel more connected to him than when he was born”. Those words made me happy and sad at the same time. Being happy was obvious as I could sense the growing bond between them. Being a mother, I want their relationship to be flourish and want our child to feel as connected with his father as he is with me. But I wondered why did this not happen earlier? Why did it take 18 months for him to feel this? What was missing in building the Daddy-baby bond? So many questions clouded my mind, leaving it muddled. I thought of asking my husband instead of probing my mind for the perfect answer. His reply amazed me and left me more puzzled. He said that earlier he (our kid) was not able to communicate much and this might be the reason for the detachment. I asked myself- ‘Why did not I feel the same because he was not talking to me either… then how did I feel connected?’ His eyes did the talking which made me understand him. His expressions made me feel more attached. A mother can feel this connection long before she can see her child. Makes sense, our child is a part of us for 9 months before he comes into the world. 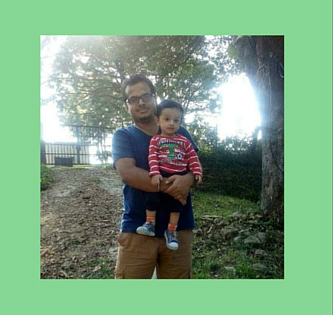 I kept on finding answers for the missing element between my child and his father. The answer my mind gave was distance. My husband’s work made him stay far from us during my pregnancy. He must have been happy but how could he experience that mixed feelings of pain and joy which I was experiencing at that time? He was away for most of the days even after K was born. This made it difficult for him to understand those early baby signals. He did not read his eyes or speak to him. He took part in the touch therapy which according to studies is very crucial in a child’s growth but eye contact was what was missing. In the first few days after birth, changes occur in the brains of both the dad and the baby, depending on whether the father is around or not. This might be the reason when few days after K’s birth, my husband said “I will work harder now.” It brought me tears of happiness. Now when he is with us, I make sure to fill the gap which was created and made him feel that something was missing. Not only I but he is also trying. 1. I ask my husband to wake K up in the morning and suggest using a little softer voice and tone. Sometimes, I ask him to soothe K to sleep. 2. I prepare the food for K and ask my husband to feed him. He is doing wonders. I don’t need to ask him to check the feeding interval as he himself checks if K’s mouth is empty before feeding next bite of food. 1. My husband brings K back home from the creche. While he is still downstairs, he allows him to run, play, shout and fall and lets him enjoy under his observance. 2. He changes K’s shorts when he wets them. Sometimes I expect a lot from him – the same which I expect from myself being a mother. Other times, I realize that’s too much to ask from a father. We can never be the same – Neither our instincts nor our parenting style. I am learning and he too is growing. After all, we were born as parents the same time as K was born.